If the last twenty years is any indication, the future poses significant challenges for marketers, especially in terms of content creation. From the mid-90s, when the internet was a novelty, to now, with our constant connection to technology, disruption has been the name of the game. Marketers have had to continually shift to keep up with emerging digital trends. While it’s true that technology innovation has a seismic effect on marketing trends, you don’t need to be a fortune teller to predict the future of marketing—you just need to follow the current trends to their logical destinations. 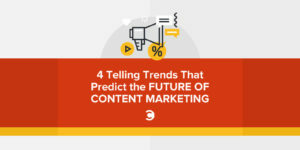 Here are four current trends, and some predictions on how these trends will influence the content marketing strategies of tomorrow. Marketing content is everywhere you look, from the copy on your tube of toothpaste, to the ads in your morning paper, to the constant stream of targeted photos, videos, blogs, and pitches on your internet sidebar. We’re continually bombarded with information, and it’s expected. 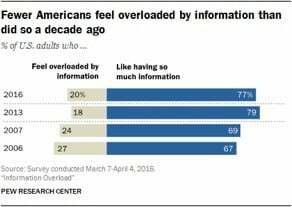 That said, 77 percent of Americans report that they like having information at their fingertips, and 81 percent feel confident in their ability to use the internet and their connected devices to keep up with the constant flow of information. 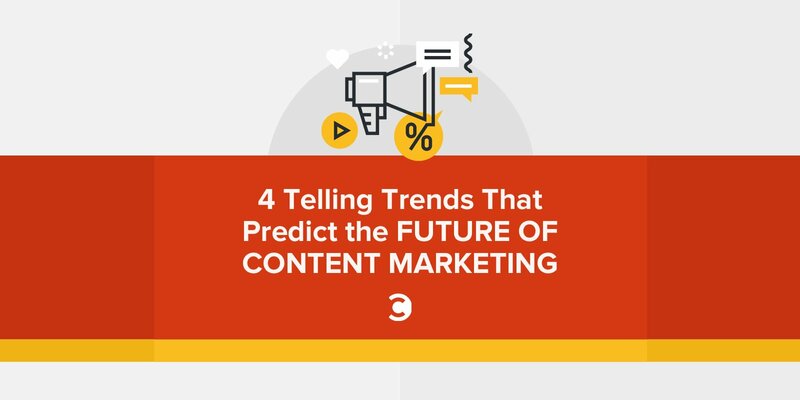 Prediction: Even higher quality content will be required to maintain brand trust. 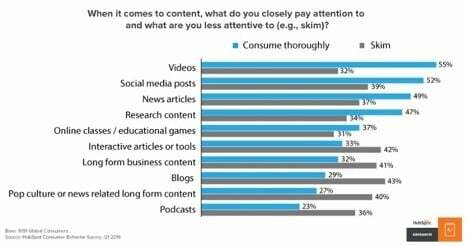 As consumer comfort-level with information overload increases, so does their demand for high-quality content. Modern consumers are self-educating, and they’re adept with finding the information they need via the internet. In order to build a strong platform for your brand, your content will need to enable the self-starting consumer to conduct in-depth research all on their own. By providing easily searchable blogs, videos, and interactive training sites, you will present your brand with confidence that will be appreciated by the internet-savvy consumer. In turn, trust for your brand will grow, because you’ll be known as a company that cuts through the bombardment of information to deliver real value for your customers, even before their first purchase. According to the 2016 Social Media Marketing Industry Report, 74 percent of social media marketers use visual assets in their social media marketing, and 60 percent use video. The push for increased visual content is directly related to shifting consumer habits. Four times as many consumers would rather watch a video about a product than read about it. Prediction: Video content will continue to dominate. According to Cisco’s Visual Networking Index, by 2019, 80 percent of all global internet traffic will come from video. According to the following HubSpot graph, video captures—and keeps—consumer attention. Marketers will be able to leverage video to captivate audiences with powerful, thought-provoking messages that are difficult to relay in other mediums. And the effort will be worthwhile, because you will know that, in a majority of cases, your complete message will be consumed. A decade ago, social media was the new, big thing. Internet users gradually abandoned their personal blogs in favor of Facebook, Twitter, and the host of other sites that followed. Between 2005 and 2016, social media adoption grew by over 60 percent. Today, 69 percent of adult internet users are on at least one social media platform. Meanwhile, once-hot platforms such as Geocities, MySpace, and others have faded into internet history. Prediction: Consumers will tell you what they want, and where they want to see it. According to the HubSpot behavior survey, internet users want to see more social posts, news articles, and video. While the top three content types aren’t surprising, the ever-changing habits of users are apparent. Not long ago, podcasts and blogs dominated the content world. Now, consumers say they would prefer online courses, research content, and interactive tools—media types that were generally unheard of, or were difficult to produce and deliver just a few short years ago. Between 2011 and 2016, smartphone adoption grew by 42 percent. According to a Pew Research study, 77 percent of adults in America own a smartphone. In the 18 to 29 age group, that figure climbs to a whopping 95 percent! As technology becomes more mobile, people rely less on their home or work computer system for content consumption. They check their email on their phone while riding the train to work, glance at social media on their tablet over lunch, and schedule meetings directly from their smart watches. Prediction: The smaller the screen, the larger the audience. As screens get smaller, above-the-fold content placement takes on an entirely new meaning. Marketers will have to prioritize a strong mobile strategy to stay relevant. Consumers are going to access websites through handheld devices more often than not, so it’s critically important that every user journey is accessible on mobile devices. Email campaigns and landing pages should be designed with a mobile-first strategy, and content will need to be short and to the point. For marketers, new technologies and resulting behaviors will create even more channels for products or services to be discovered by consumers. Marketers who anticipate and adapt to the trends will ultimately build a stronger brand that’s more likely to stay relevant through the future waves of disruption that are sure to come. Mark Yeager is chief strategy officer and partner at Yeager Marketing. After twenty years in corporate marketing leadership with companies such as CA Technologies, Pragmatic Marketing, and iLinc Communications, he co-founded Yeager Marketing with a goal of creating an agency that truly understands the challenges of brand-side marketers.